Sales of several major Scottish newspapers have fallen substantially in the past month, according to the latest circulation figures. The Sunday Mail, the Sunday Post and Scotland on Sunday all saw their sales drop below key milestones: The Sunday Mail's circulation fell below 300,000, the Post's below 250,000 and Scotland on Sunday's below 40,000. The Scotsman and the Daily Record both recorded their lowest weekday sales figures in modern times. The figures come as the debate continues over how the press should be regulated in the wake of the Leveson Report and whether separate regulation in Scotland is practical or desirable. Sales of most newspapers - north and south of the border - have fallen substantially in recent years and the trend shows no sign of ending. Amongst the Scottish titles, the most symbolic falls in November concern the Sunday papers. The Sunday Post saw its sales fall below a quarter of a million for the first time in living memory. Between October and November its sales dipped nearly 8% from 268,000 to just under 247,000. The Sunday Mail also fell below a milestone. It dropped 5% in a month from 308,000 to 293,000. Annual comparisons are misleading though as the popular newspaper market last autumn was distorted during the period between the closure of the News of the World and the launch of The Sun on Sunday. Last month, the Scottish edition of The Sun on Sunday sold just over 203,000 copies. At the other end of the market, Scotland on Sunday dipped below 40,000. Its sale of just over 39,250 is down from 49,000 last November. On weekdays the Daily Record fell close to 253,500 - down 15,000 in a month and 25,000 in a year. The Sun sold 286,000 in Scotland. Its sales are also down on the year but the gap with the Record remains broadly similar. In what the industry defines as the quality market, The Scotsman's circulation fell to below 33,000 against 39,000 last November. But an analysis of the figures reveals that between Monday and Friday, the number of copies actively bought by readers drops to around 28,500. The headline average is affected by a significantly higher sale on Saturdays and some 2,500 so-called multiple copies which are given away free to the public in, for instance, hotels. 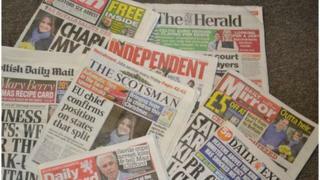 Monthly sales figures are no longer issued for either The Herald or the Sunday Herald. Their next set of sales figures - covering the whole of the second half of 2012 - is expected in February.